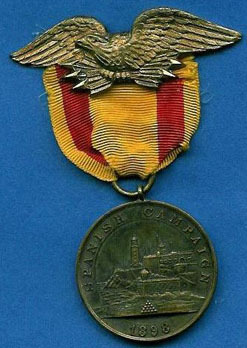 The Spanish Campaign Navy Service medal was originally issued by the United States government in 1908 to all members of the the U.S. Navy who served at sea in Cuban or Puerto Rican waters between May 1, 1898 and August 16, 1898. Later, in the 1920's, it was also given to members of the U.S. Navy who served in the waters around Guam and the Philippines. It is very similar to the Spanish Campaign Marine Corps Service medal and the and the Spanish Campaign Army Service medal. The front side (left, above) has the statement "SPANISH CAMPAIGN" around the top. At the bottom is the date "1898." Depicted in the center is a typical coastal spanish fortification, possibly intended to be Havana's Morro Castle, a symbol of the war. Below the fortification is a pile of cannonballs. The reverse side (right, above) has the statement "UNITED STATES NAVY" around the top, and "FOR SERVICE" below the eagle. The center bears the image of an eagle alighting on a foul anchor. Below the words "FOR SERVICE" are two types of leaves. The leaves curving to the left are oak leaves, a symbol of strength. The leaves curving to the right are olive leaves, the symbol of peace. Originally, the medal had a different color ribbon (see below). The ribbon colors were, by accident, the colors of the Spanish flag. These medals were initially issued, and were later to have been replaced with medals bearing the new ribbon (see above). Still, the medal shown below was issued between 1908 and 1913. This medal was issued to 2nd Class Boatswains mate, Ingval H. Pedersen of the USS OLYMPIA. It is interesting that Pederson received this older medal. As a member of OLYMPIA's crew, he should not have received the medal until the 1920's, and the red and gold ribbon was discontinued in 1913. Pederson, a native or Norway, also served on the "U.S.S. PRINCETON," "U.S.S. TACOMA," "U.S.S. FISH HAWK" and "U.S.S. BUFFALO" during his naval career. Cohen, Stan. Images of Spanish American War, April-August,1998. (Missoula:Pictorial Histories Publishing Co., Inc., 1997) 357. Hoiland, Tom (Stavanger, Norway) - Medal of Ingval H.Pedersen.